VietNamNet Bridge – Archaeologists have recently revealed their findings of old tombs excavated in the Mekong Delta province of Ben Tre. 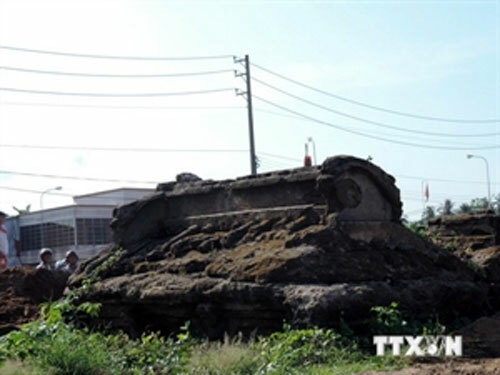 From April 26 to May 7, experts from the Ben Tre Museum and the University of Social Sciences and Humanities in Ho Chi Minh City unearthed a tomb and a smaller one perpendicular to it at Cho Lach Town in the district of the same name. According to Assoc. Prof. Pham Duc Manh, dean of the school’s Faculty of Archaeology, the tombs might date back to the late 18th or the early 19th century. They embody features of those built for aristocrats under the Nguyen Dynasty (1802-1945). The bigger tomb was built in the form of a traditional house, while the other is similar to a small temple, he said. Notably, they were built from a mixture of substances, including shell, sand and, especially, sap extracted from “o duoc” trees (Lindera myrrha) – which is said to help structures endure. The corpses, including one of a child, were buried directly underground with the depth of up to 275 cm. This is the first time Vietnamese experts have discovered a whole tomb made from such a mixture reserved for a child, Manh noted.